You can quickly reset all the options on the Nikon D3400’s Shooting menu by selecting the Reset Shooting Menu, as shown on the left. Likewise, the Setup menu also has a Reset Setup Options item to restore all settings on that menu, as shown on the right. 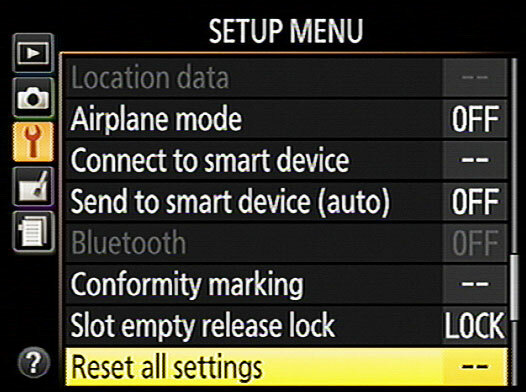 Choose the Reset option to return to the default settings for the respective menu. For a more drastic camera reset, scroll to the last page of the Setup menu, where you find the Reset All Settings option, shown here. Choosing this option restores everything except the Language, Time Zone and Date, and Guide mode settings to their factory default. Choose this Setup menu option to restore all but a couple camera options to their factory-default settings. Resetting the Shooting menu defaults wipes out any customizations you made to a Picture Control setting — for example, if you tweaked the Vivid setting to produce even more saturated colors than it does by default. Additionally, a Shooting menu reset restores the default settings of a couple options not on the menu, including the Release mode, Exposure Compensation, Flash Compensation, Flash mode, and selected focus point. Finally, the AE-L/AF-L button returns to its normal operation as well. More worrisome is that resetting the Setup menu or choosing Reset All Settings restores the File Number Sequence option to its default, Off, which is most definitely Not a Good Thing. So if you restore the defaults, be sure that you revisit that option and return it to the On setting. See the preceding section for details. Choosing Reset Setup Options does not affect the Time Zone and Date, Language, or Storage Folder options. So you need to adjust those settings individually if necessary.